You may be familiar with the stories of 17th century Holland and the speculative frenzy now known as 'tulip mania'. It was a time during the Dutch 'Golden Period' when tulip bulbs were treated like a form of currency, and just like the California gold rush, people abandoned jobs, businesses, wives, and homes, all to become tulip growers. Records during this period show that one Dutchman got completely carried away with one investment. In fact after a long period of hard bargaining, he paid out thirty-six bushels of wheat, seventy-two of rice, four oxen, twelve sheep, eight pigs, two barrels of wine, four barrels of beer, two tons of butter, a thousands pounds of cheese, a bed, a suit of clothes, and a silver cup, just for a single Viceroy bulb! This was worth in today's money approximately £25,000, clearly a sellers market. Another such story is this, an 'up and coming' bulb speculator managed to procure himself a rather special variety that cost him its weight in gold. Soon after, he found out that there was a second, identical specimen that was owned by a local cobbler. He approached and then bought the cobbler’s bulb, and in an apparent fit of madness crushed it. Perhaps he was sane after all as he believed that by doing so he would markedly increase the value of his first bulb. This proves that money does do strange things to people. Dutch history is littered with such stories, although these are perhaps the most extreme. But what it does do is help us to understand how much the Dutch - as well as other European races -held the tulip in high esteem. Owning and flaunting rare specimens was a reflection of your wealth and standing within society. Up until this point contemporary tulips, although bold in colour, were only ever a single colour, ie if they were red then they would be a block of red colouration, if they were yellow then they would be a block of yellow colouration. The change came about with the introduction of the 'broken' tulip - this meant that the tulips lock on its single bold colour was broken allowing unique colour variations never seen before. We already know that tulips were very popular right across Northern Europe so when these rare and yet incredibly beautiful new strains arrived, the market for them was already waiting. It's no wonder that these stunning bulbs were so sought after and commanded such extraordinary prices. Of course when you look around today's garden retailers you'll find that tulip bulbs only cost a few pounds per pack, but the question is this. Are you still able to by those old varieties that took Holland - if not Europe - by storm over 250 years ago, but now for a fraction of their original price? The answer is yes and no, and maybe with a little bit of research thrown in. Specimens such as the famous 'Viceroy' and 'Semper Augustus' have unfortunately disappeared. As have the legendary 'Rembrandt' varieties, so called because of the abundance of tulips in famous Dutch Master paintings in this era; though strangely tulips were not a prominent theme in Rembrandt's own work. So how is it that such beloved varieties have become all but lost to us during the course of history when other cultivars from this period are still readily available? The answer is hidden in front of eyes and its all down to the secret of their broken colours. During the eighteenth century broken colours, as far as the breeders were concerned were in the hands of god, but with today's modern techniques for genetic manipulation the answers have been discovered. It turns out that these once most highly prised of plants had gained their delicately feathered patterns from an infection known as the Tulip Breaking Virus or TuB virus. This form of the mosaic virus is carried by the green peach aphid, which passed on the infection every time it fed on a new tulip - although the virus did not break the colour in white or yellow bulbs. This was a common pest in European gardens during the seventeenth century, and while it did indeed produces some fantastic and colourful flowers it also weakened them, eventually killing them. Today plants holding the virus are banned and nurseries finding infected stock will destroy them on sight. Any varieties bought today that display a similar colouration to these old favourites are not virus infected plants. Their colouration is in fact the result of a natural change in the upper and lower layers of pigment in the petals. But it wasn't just broken tulips that were popular during this period of horticultural history. Below is a list of species and cultivated varieties from the tulip mania period that - with a bit of persistence - you can still find today. 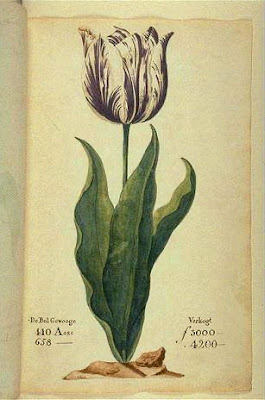 Tulip Viridiflora - 1700. These tulips have feathered green markings and striations on petals of various hues. Twentieth century viridiflora cultivars include "Golden Artist" (golden yellow with green stripes); "Groenland" (pale pink with flames and blushes of rose and pale green); and "Spring Green" (creamy white with blush green). 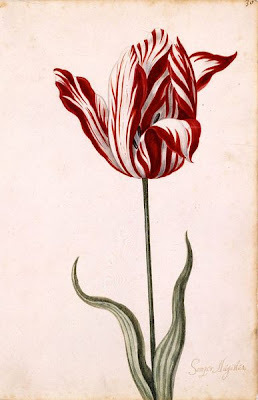 Tulip tarda - 1590s. This multi-flowering botanical tulip has chrome yellow petals edged in bright white. It's stunning, star-shaped blossoms open late in the season on sturdy six-inch stems. Tulipa 'Duc van Tol' cultivars - Red and Yellow 1595, Rose 1700, Scarlet 1700, Aurora (Winter Dukes) 1700. Tulip 'Perfecta' -1750. A parrot variety. In Holland there is a living museum of historic tulip bulbs found at the Hortus Bulbum. Here Dutch nurserymen try to collect, maintain and propagate what in many cases are the last remnants of this golden age. You can still buy tulipmania bulbs from here - in fact there are whispers of the existence of some old broken varieties - but their supply is heavily restricted. The only other supplier who has access to Hortus Bulbum bulbs is in the USA and that is the Old House Gardens nursery. Other suppliers of these fascinating bulb varieties are few and far between, but with a bit of courage and a lot of research I'll guarantee you will find one.